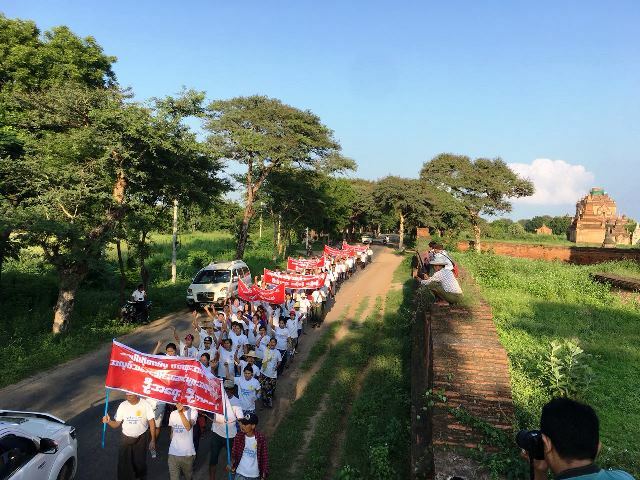 In 2015, after a majority of workers at the Hotel Tharabar Gate in the heart of the country's famous Bagan Archeological Zone formed their union, management attempted to dismiss elected union chairman Ko Nay Myo Win. Hotel staff including non-union members protested, and management relented. The union then joined together with other local hotel unions (including the union at the Bagan Hotel River View) to form the area-wide union organization HLOB, which elected him chairman. On August 24 this year, the Tharabar Gate management again terminated the union chairman, along with 11 other workers, including two members of the union executive and 7 active union members. The formal justification given for the dismissals was a downturn in occupancy. However, at a meeting with management the previous day, the union had declared itself willing to negotiate alternative work arrangements which would also safeguard employment. The management response was to target union officers and activists for dismissal, violating their rights and the rights of all union members, including the members of the HLOB who elected Nay Myo Win as their secretary. Bolstered by Myanmar's weak legal framework for protecting rights, management continues to reject calls for reinstatement of the 12 unfairly dismissed workers, despite a vigorous series of public protests organized by the HLOB. CLICK HERE to send a message to management of the Hotel Tharabar Gate, calling for reinstatement of the 12 unfairly dismissed workers; full recognition of the rights and role of the union chairperson and executive committee members; and good faith negotiations with the union. The managing director of the Tharabar Gate is an influential member of several Myanmar hospitality employer organizations. The message is therefore directed at them as well.